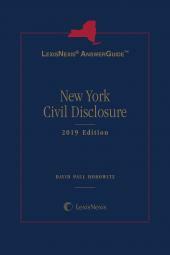 LexisNexis AnswerGuide New York Civil Disclosure provides New York-specific information for each stage of the disclosure process. 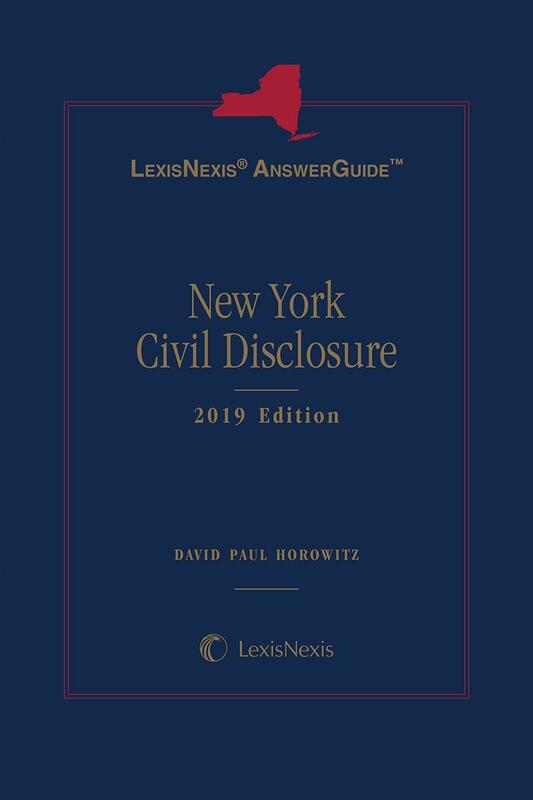 The one volume LexisNexis AnswerGuide New York Civil Disclosure provides New York-specific information for each stage of the disclosure process. It combines analysis of the CPLR and related statutes, court rules, and case law with expert insight on the conduct of effective disclosure. Topically organized, this portable tool provides quick on-point answers at the office, in court, or at a deposition. It includes 60 detailed, task-oriented checklists and over 141 practice pointers (Warning, Strategic Point, Exception, Timing) to ensure best practices and avoidance of potential practice pitfalls. LexisNexis AnswerGuide products are available in eBook, print and online and combine practical answers with guidance to relevant cases, codes, rules and in-depth analytical sources. 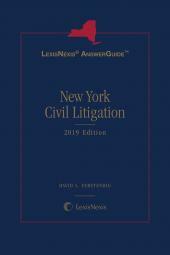 In print and eBook, LexisNexis AnswerGuide New York Civil Disclosure serves as a portable practice resource for the New York litigator. Cites to case law, statutory and analytical cross-references are designed to bridge the gap between print and online sources, making in-depth research easier and more on-point than ever before. David Paul Horowitz is a member of Geringer, McNamara & Horowitz in New York City, and has represented parties in personal injury, professional negligence, and commercial cases for over twenty-seven years. Complementing his litigation practice, he teaches New York Practice at Columbia Law School and serves as a private arbitrator, mediator, discovery referee, and expert witness. 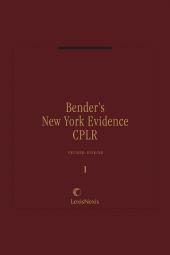 In addition to his work on New York Civil Disclosure, since May 1, 2010 he has been the sole author of the nine-volume treatise Bender's New York Evidence (LexisNexis), as well as the 2008 Supplement and forthcoming Third Edition of Fisch on New York Evidence® (Lond Publications). He also pens the New York State Bar Journal's monthly column Burden of Proof,  currently in its twelfth year. He serves on the Office of Court Administration's Civil Practice Advisory Committee, as Reporter to the New York Pattern Jury Instruction (P.J.I.) Committee, is a member of the New York State Bar Association's C.P.L.R. Committee, and has been selected eight times since 2007 for inclusion in the New York Super Lawyers listing. 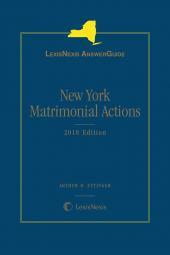 Mr. Horowitz is a frequent lecturer on civil practice, evidence, ethics, and alternative dispute resolution throughout New York State for the New York State Judicial Institute and on behalf of numerous bar associations, law firms and legal departments. He received his A.B. from Lehman College of the City University of New York and his J.D. from Fordham University School of Law. He welcomes comments, questions, and referrals, and can be contacted at david@newyorkpractice.org or 914-424-1113.